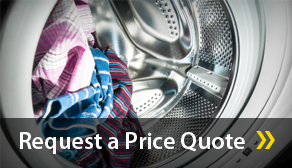 Are you thinking about building a laundromat? WORK WITH THE BEST IN THE BUSINESS! Did you know that the Huebsch distributor network carries the highest rated customer satisfaction score? Better than Dexter. Better than SpeedQueen. Better than anyone. You have absolutely come to the right place. National Laundry Equipment, LLC and Huebsch is your smart laundry solution. The Laundry business is a great business! Check out this video with our customer Steve in Nashville, TN! 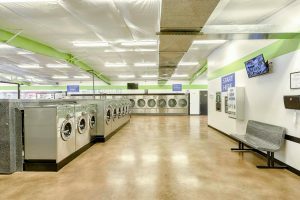 Steve and the team at National successfully turned a dilapidated stand alone building that really needed to be demolished into a super modern, super efficient laundromat! and, Walk you through the entire process from installation to running a successful laundromat. Is the Coin or Card Laundry Business right for you? You need only look around a commercial area to see the success of businesses catering to our fast-paced society needs. Drive-through coffee shops, 10-minute oil change, fast-food restaurants and automatic car wash franchises are just a few of the models turning time savings into profits. Coin laundries are providing similar efficiency with their large, multi-load commercial laundry equipment. These machines enable customers to reduce what would be an all-day task in their homestyle washer and dryer, to just one hour at a vended laundry. Investors have been parlaying time savings into big profits, particularly in the United States, where coin laundries generate $5 billion annually, according to the Coin Laundry Association (CLA). Adding to the appeal of self service vended laundries as an investment opportunity is the fact that clean clothes are a necessity. One can choose not to go out for lunch, a premium cup of coffee or even wash their car. But clean clothes are a must. That fact also makes the business virtually recession proof. And coin laundries deliver benefits other ventures can’t, starting with no franchise fees. 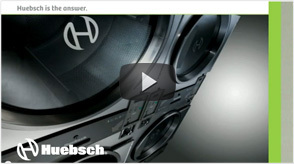 Once you open a vended laundry with Huebsch® equipment, the business is all yours. Unlike many other small business ventures, vended laundries have no on-going corporate mandates or annual franchise fees. We not only build beautiful facilities for people to do their laundry, we carry amazingly fun items to occupy their time. Your space sets you apart from our competition! Check out some of our special items that you won’t find in other laundry distributor’s catalogs!